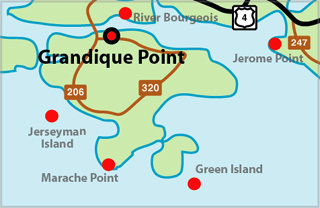 The Grandique Point Lighthouse, also known as Grandique Ferry Lighthouse, is located at Martinique on Isle Madame, in Chedabucto Bay. It is an aid to navigation for Lennox Passage, which is the channel of water between the southern shore of Cape Breton Island and Isle Madame. The first Grandique Point Light, also known as Grandique Ferry Lighthouse, was built in 1884. The first lightkeeper was Daniel Clough, son of the merchant Nathaniel Cough, a recipient of one of the first Crown Land grants on Isle Madame. In the late 1800s the lighthouse was flanked by docks for limestone and plaster quarries and quays for the Isle Madame farmers to bring their produce and livestock to market. There was also a passenger ferry that landed on Grandique Pointe quite near the lighthouse. Many of these features can still be seen today in this beautiful historic area. The most recent lightkeeper was Stanley Forgeron who oversaw the conversion to an automated light in 1961. The Crown Land on which the lighthouse is situated became a Provincial Park in 1981 and is a favourite spot with Islanders and visitors for picnics, hiking, swimming and in the winter, cross country skiing. An Osprey has taken up residence atop the lighthouse. The Osprey is Nova Scotia's Provincial Bird. Watch for it diving for fish in the area of the lighthouse. Notice the curve of the tower under the gallery - this is now a sharp angle. This picture was taken before the lighthouse was repaired in 2011.